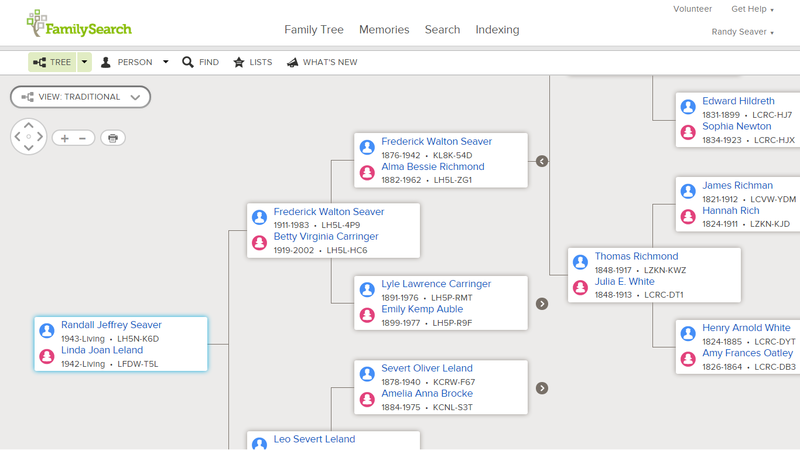 Genea-Musings: How Do I Plan to Save My Genealogical Research for Posterity? How Do I Plan to Save My Genealogical Research for Posterity? "/// [what] are the methods most likely to have longevity in my absence. My family will not continue my Ancestry subscription, my computer will probably be given away along with my notebooks... so I have started uploading for public access to FamilySearch.org for tree info/documents/photos. Those that need it will have access and hopefully the next family generation that HAS a family researcher can have access. It is sad, but true reality.﻿"
The key question here is longevity - what will probably be around long after I'm gone. Like Cary, my family doesn't seem interested in my research. 1) Like Cary, I am adding or editing persons in my ancestral families to the FamilySearch Family Tree, including source citations, person notes and event notes, and some photos and stories. This works well until I get back to where the persons are Individuals of Unusual Size (IOUS) that cannot be merged or edited. 2) I upload a new Ancestry Member Tree every year or so with all of my RootsMagic database information, including attached media and person Notes. Unfortunately, the Notes are not observable by anyone but the owner or the editor. 3) I have created PDF documents of a lot of my genealogical research, using the report features of RootsMagic and Legacy Family Tree. I have put these on the free site, www.Scribd.com. The reports include my research with sources, but not with Notes. My reports are at http://www.scribd.com/randy_seaver. The purpose here is to provide a website that can be searched using search engines that contains my research information. I need to update the reports on an annual basis. 4) Some people write "genealogical wills" in hopes that their heirs and descendants will carry out their wishes. I will leave a "When I Pass Away" document on my computer (and probably send to them via email before I pass away) that, hopefully, my daughters will read and carry out. This will include my usernames and passwords for Ancestry and other websites, my Scribd website, my blog archives, etc. 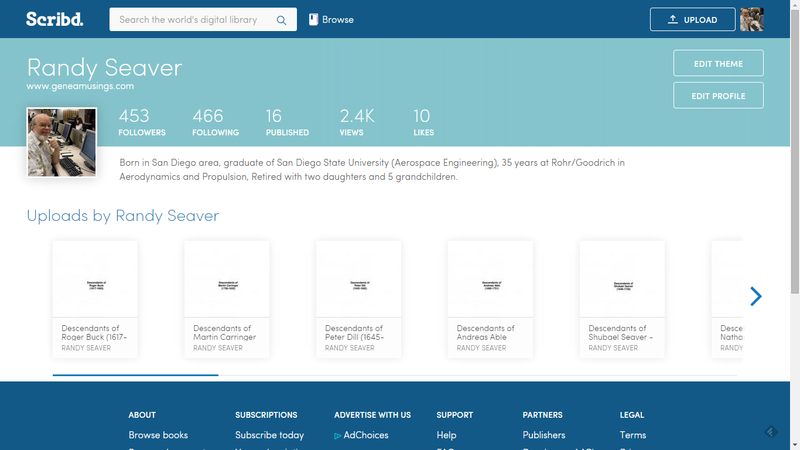 I also want them to print off a copy of my Scribd reports and send them to a number of repositories (e.g., the Family History Library, the New England Historic Genealogical Society, Allen County Public Library, Library of Congress, San Diego Central Library, etc.) so that the research content will be on a bookshelf somewhere. 5) My genealogy blogs should survive for awhile since they are on Google. If Google decides to sunset unused blogs at some point in time, then this archive of my genealogical research may go away. I may use the blog archives to create family story books for some of my ancestors for whom I have photos and stories. I may also create MyCanvas type of coffee table books and pass them to my daughters and brothers, but I haven't done it yet. 6) I plan to create beautiful wall charts for my ancestors that show my daughters and grandchildren and their Seaver-Leland ancestors. A chart with 6 to 8 generations of ancestors (with photos) should be sufficiently large to dominate a wall. I haven't done this yet. In the worst case, my daughters can probably create them from my computer file and work with the chart maker to customize them. None of that is 100% sure of being carried out, especially if there is a significant catastrophe that wipes out the Internet, or civilization, as we know it. What other measures do my readers suggest? Please share them in comments to this post, or in your own blog posts, and I will collect them so everyone can benefit from them. This is a project that can't wait, Randy. I've already made register style reports of ten generations and passed it out to relatives for Christmas presents. Don't wait "until its finished" or "when I get more information" because REALLY who is ever done with their genealogy. Get out copies ASAP. This Christmas! While you are at it, donate an extra copy to your local library, genealogy society or to the library or historical society where the majority of your people lived. - - Also, Blurb will slurp your blog, so there is minimal work in getting a hard copy of your posts in book form. This is a project you can do ASAP, too. Thanks for the shout out Randy. I really think as we get older where our research is going [literally and figuratively] should be a focus. I am making decisions differently now and it looks like you are too. Thanks for the great look at your research retention steps. Definitely a deep question, Randy, and I haven't found an answer myself either. Just focusing on the digital data for a second, as hardware and computer operating-systems change, there will always be a route to migrate your data to a newer platform -- if someone is sufficiently interested in maintaining it -- but what about the actual data format? If the data format is proprietary, including database schemas, then will there be any runnable programs in the world that will still be able to make sense of it in times to come? If the structure of online sites is insufficient to accurately represent your data -- for instance, because they're "tree focused" -- then you have probably invested in some desktop program which may have a limited longevity. Even standardised data formats for images (e.g. jpg) and video (e.g. mp4) may be superseded over time but at least they have a public specification and so such data could still be read, if necessary. Maybe this is a question for FHISO: do we need a standardised format for our genealogical data that is neutral with respect to hardware and software, or is some format that only offers limited exchange capabilities sufficient? You could donate your research to a major library during your lifetime. I know the Allen County Public Library accepts donations of organized materials, either paper or digital. Excellent post, Randy. I will be sharing these ideas with my students and using some of them myself. Thanks. My friends and I discuss this more often these days -- I guess it's a boomer thing. We're also a population who have used computers long enough to know that companies come and go, data formats change, new computers can't accept connectors from older peripherals, and companies have no interest in supporting last year's model of data, software, or hardware. Randy, I've found it very time-consuming to get just one nuclear family with about 10 children onto FamilySearch's Family Tree with their sources, even though I already have them researched and documented on my desktop. Importing a Gedcom with fewer than 100 people was a disaster, requiring more clean-up time than retyping it all by hand would have taken. How have you progressed in putting your tree onto Family Tree? Is there a secret technique that I'm missing? I've been toying with the hard-cover photobooks that so many websites will let us format online, and then print and ship them to us. I think the images can act as eye-candy, and I can slip in narratives about the people and documents in the images. My feeling is that it needs to have hard covers to defend itself over time on a shelf, and people will hold onto it for the photos with labels, even if they don't care about the text. By the way, many of the sites that offer this service have sales around May-June, and probably November-December. I like the fact that I can keep the master on the web site, revise it as I need to, and print on demand when I have the funds or need a gift for a wedding or new baby. Randy, I've thought about this, too, since many of my family members haven't shown much interest. I love your ideas and am including this post on my Recommended Reads tomorrow at www.emptybranchesonthefamilytree.com. Thank you! I have settled on ancestry.com, family search, we relate and scanning my research binders and sending them to Mocavo. As it has already been said - none of this goes from one to the other in a clean and complete fashion. Lots of follow up typing to try and get all the information in there. There is too much 'secretarial' work in genealogy. I don't like having to check things and re enter missing data. What a waste of time! These are great ideas here. I have a scribd account (free version), but haven't uploaded anything yet. Two things could resolve this problem. First is an XML-based data standard to replace GEDCOM. Second, genealogical societies need to realize what an asset this service would be for their members. With digital storage getting cheaper every day, building member archives can be a very lucrative operation. I would much rather give my research to the society (or societies) near me or where my ancestors lived than to a commercial enterprise. I have gone back to paper. I have my tree on line but since no one is interested no one will find it when I die. At least with binders of paper they will have to open the binder to see what's in there. I have also written the story of several couples with some still to write. I've given binders with the stories to some relatives. The feed back on the stories has been positive but it hasn't sparked any interest in anyone. Why bother if I'm going to do the work and print the book for free? These are very valuable suggestions, and I plan to follow some of them myself. 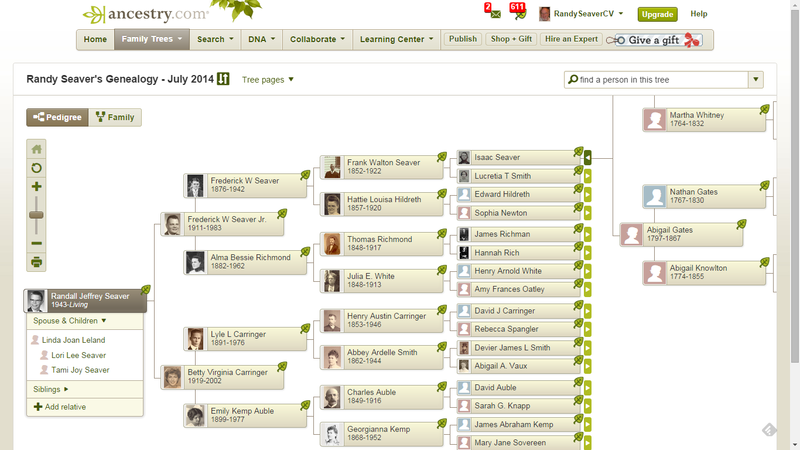 I have to point out that -- these days -- Ancestry's public member trees are visible only to current subscribers. I think that the change came about in the last year or two. Everyone can _post_ a tree there, but only members can look at others' trees. I speculate that this is to increase the competitive value of their DNA products? It appears to me that a Google search no longer finds names in member trees on Ancestry. At least, it doesn't find two unusual names that are in my public member tree. These points don't invalidate the usefulness of posting a tree there -- only that it won't reach such a wide audience as it once did.